The Google Analytics 360 Suite is an advanced and powerful analytics solution for large enterprises. It solves some of the most common challenges companies have with standard Google Analytics, including sampled reporting and exceeding monthly hit limits, while also providing the ease of use and familiarity that is often lacking in other premium analytics tools. While it’s beneficial for companies to overcome these challenges, are these reasons really enough to justify a six-figure investment in a Google Analytics 360 annual licence? 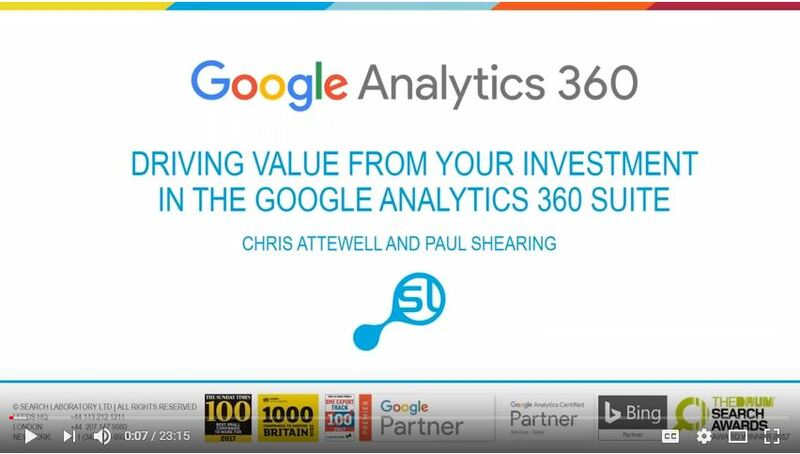 The real value of Google Analytics 360 lies in knowing how to use its advanced features and integrations to their full potential, allowing you to make better decisions based on enhanced data to drive value and return on your investment. Paul has worked at Search Laboratory for 12 years and currently leads the operational analytics and data science team. Having started in paid search, Paul has also specialized in conversion optimization and is now an expert in Google Analytics 360. He works with clients, such as multi-channel retailer Studio, to drive value from the platform and utilize its advanced features. Chris began his career in export sales and marketing before finding his way into the digital world and worked in email and marketing automation prior to joining Search Laboratory. Chris provides strategic leadership and direction for Search Laboratory’s global operations, working with clients and internal teams to deliver profitable online customer acquisition campaigns across multiple countries.